The highest-level men's professional soccer league in the U.S. is Major League Soccer. MLS began to play in 1996 with 10 teams and has grown to 24 teams (21 in the United States and 3 in Canada), with further expansion planned to 30 teams. The MLS season runs from March to December, with the regular-season winner awarded the Supporters' Shield and the post-season winner awarded the MLS Cup. With an average attendance of over 20,000 per game, MLS has the third highest average attendance of any sports league in the U.S. after the National Football League (NFL) and Major League Baseball (MLB), and is the seventh highest attended professional soccer league worldwide. The first women's professional soccer league in the U.S. formed after the success of the 1999 Women's World Cup. The Women's United Soccer Association (WUSA) ran from 2001–2003 and featured many of the World Cup stars, including Mia Hamm, Michelle Akers and Brandi Chastain. Its successor Women's Professional Soccer (WPS) ran from 2009–2012. Currently, the National Women's Soccer League (NWSL) is the top professional league in the country and was formed in 2012. The most recently completed 2017 season was its fifth. The NWSL season runs from spring to early fall (typically April – October). In 2017, A&E Networks bought an equity stake in the league and broadcasts a game of the week on Lifetime, and formerly streamed all games online via the go90 platform. During the 2018 season, the NWSL moved some of the games originally scheduled to air on Lifetime to evening slots on ESPNews (both channels being part of the Disney family), and when go90 owner Verizon shut down that platform at the end of July, the NWSL streamed the games that were intended for go90 on its own website. U.S. soccer fans also follow the U.S. national teams in international competition. The 2015 FIFA Women's World Cup Final drew a record 26.7 million viewers, greater than final games of the 2014 World Series or the 2015 NBA Finals, and the 2010 Men's World Cup final drew 26.5 million viewers. The women's national team has won three Women's World Cup titles and four gold medals at the Summer Olympics and the men's national team played in every World Cup from 1990 to 2014. In the United States, the sport of association football is mainly referred to as "soccer", as the term "football" is primarily used to refer to the sport of American football. There has been some debate about the origins of modern soccer in America. It has long been held that the modern game entered the States through Ellis Island in the 1860s. However, 2013 research has shown that soccer entered America through the port of New Orleans, as Irish, English, Scottish, Italian and German immigrants brought the game with them. It was in New Orleans that many of the first games of soccer in America were held. The origins of the game in general trace back to ancient Greece, Rome, Egypt, or China. It is difficult to say for sure which country was the true origin. Oneida Football Club has been named as the first association football club in the United States but there is still discussion on what rules the club used, and it broke up within the space of a few years. According to Encyclopædia Britannica, the club is often credited with inventing the "Boston Game", which allowed players to both kick a round ball along the ground, and to pick it up and run with it. The earliest examples of governance in the sport started in 1884 when the American Football Association (AFA) was incarnated. The AFA sought to standardize rules for the local soccer teams based in the Northeastern United States, particularly in northern New Jersey and southern New York state. By 1886, the AFA had spread in influence into Pennsylvania and Massachusetts. Within a year of its founding, the AFA organized the first non-league cup in American soccer history, known as the American Cup. For the first dozen years, clubs from New Jersey and Massachusetts dominated the competition. It would not be until 1897 that a club from outside those two states won the American Cup. Philadelphia Manz brought the title to Pennsylvania for the first time. Due to conflicts within the AFA, the cup was suspended in 1899, and it was not resumed until 1906. Early soccer leagues in the U.S. mostly used the name "football", for example: the AFA (founded in 1884), the American Amateur Football Association (1893), the American League of Professional Football (1894), the National Association Foot Ball League (1895), and the Southern New England Football League (1914). Common confusion between the terms American football and association football eventually led to a more domestic widespread use of the term soccer with regard to association football. Originally seen as a British slang term for "association", the use of soccer began appearing in the late 1910s and early 1920s. A noticeable example was the American Soccer League (ASL), which formed in 1919. The governing body of the sport in the U.S. did not have the word soccer in its name until 1945 when it became the United States Soccer Football Association. It did not drop the word football from its name until 1974, when it became the United States Soccer Federation, often going simply as U.S. Soccer. On April 5, 1913, the AAFA reorganized as the United States Football Association (USFA), presently known as the United States Soccer Federation. FIFA quickly granted a provisional membership and USFA began exerting its influence on the sport. This led to the establishment of the National Challenge Cup, which still exists as the Lamar Hunt U.S. Open Cup, that fall. The National Challenge Cup quickly grew to overshadow the American Cup. However, both cups were played simultaneously for the next ten years. Declining respect for the AFA led to the withdrawal of several associations from its cup in 1917. Further competition came in 1924 when USFA created the National Amateur Cup. That spelled the death knell for the American Cup. It played its last season in 1924. During the days of the American Soccer League, the league was seen as widely popular, and considered to be the second-most popular sports league in the United States, only behind Major League Baseball. However, the "soccer war" between the USFA and ASL, combined with the onset of the Great Depression in 1929, led to the demise of the ASL in 1933, and the demise of the sport in the United States, entering a prolonged time of obscurity. In spite of this, the national soccer team competed in the first two FIFA World Cups, managing to qualify for the semifinals of the first tournament and qualifying for the following one in Italy, where the U.S. team was knocked out in the first match by would-be world champions Italy. The prominence of college soccer increased with the NCAA sanctioning an annual men's soccer championship, beginning in 1959 with the inaugural championship won by Saint Louis University. Two professional soccer leagues were started in 1967, the United Soccer Association and the National Professional Soccer League, which merged to form the North American Soccer League in 1968. The NASL enjoyed a significant boost in popularity when the New York Cosmos signed Pelé to play for three seasons in 1975–77. The Cosmos drew large publicity throughout the late 1970s. Between 1977 and 1980, the Cosmos drew crowds of more than 60,000 on ten occasions, and over 70,000 on seven occasions (see Record attendances in United States club soccer). The NASL declined during the early 1980s and disbanded in 1984. The popularity of indoor soccer peaked in the 1980s, with both the NASL and the Major Indoor Soccer League operating indoor soccer leagues. The 1970s and 1980s saw increased popularity of the college game. Women's college soccer received a significant boost in 1972 with the passage of Title IX, which mandated equal funding for women's athletic programs, leading to colleges forming NCAA-sanctioned women's varsity teams. A men's match between Saint Louis University and local rival SIU Edwardsville drew a college record 22,512 fans to Busch Stadium on October 30, 1980. By 1984, more colleges played soccer (532) than American football (505). In 1967 there were 100,000 people playing soccer in the US; by 1984, that number had grown to over 4 million. Girls high school soccer experienced tremendous growth in playing numbers throughout the 1970s and 1980s—from 10,000 in 1976 to 41,000 in 1980, to 122,000 in 1990. The soccer matches for the 1984 Summer Olympics were well attended. Five matches drew over 75,000 fans, and two soccer matches at the Rose Bowl stadium in Pasadena, California, drew over 100,000 fans. These high attendance figures were one factor that FIFA took into consideration in 1988 when deciding to award the 1994 World Cup to the United States. Interest in soccer within the United States continued to grow during the 1990s. This growth has been attributed in significant part to the FIFA World Cup being held in the United States for the first time in 1994. This won the sport more attention from both the media and casual sports fans. The tournament was successful, drawing an average attendance of 68,991, a World Cup record that still stands today. The 1994 World Cup drew record TV audiences in the U.S.
As part of the United States' bid to host the 1994 World Cup, U.S. Soccer pledged to create a professional outdoor league. Major League Soccer launched in 1996, which helped develop American players in a way that was not possible without a domestic league. Many of these players competed in the 2002 FIFA World Cup, where the United States reached the quarterfinals, its best result in the modern era. The team would qualify for eight consecutive World Cup tournaments between 1990 and 2014 before failing to qualify for the 2018 tournament, which would be the first such occurrence since 1986. The growth of the women's game during the 1990s helped increase overall interest in soccer in the United States. The number of women's college soccer teams increased from 318 in 1991 to 959 in 2009. Both the 1999 and 2003 FIFA Women's World Cups were held in the United States. The crowd of over 90,000 at the Rose Bowl for the 1999 FIFA Women's World Cup Final remains the largest crowd in the world to witness any women's sporting event. As of 2006[update], over 24 million Americans play soccer. There are 4.2 million players (2.5 million male and 1.7 million female) registered with U.S. Soccer. As of 2012[update], thirty percent of American households contain someone playing soccer, a figure second only to baseball. Increasing numbers of Americans, having played the game in their youth, are now avid spectators. The annual ESPN sports poll has shown soccer as the fourth most popular team sport in the United States every year since overtaking hockey in 2006; as of 2011, 8.2% of Americans rank soccer as their favorite sport (compared to 3.8% for hockey). A 2012 Harris Interactive poll showed soccer to be the fifth favorite team sport, with 2% of Americans ranking soccer as their favorite (compared to 5% for hockey). A 2011 ESPN sports poll ranked soccer as the second most popular sport in the country for 12- to 24-year-olds. In 2013, Lionel Messi became the first soccer player ever to rank among the Top 10 most popular athletes in the U.S. in an ESPN poll, although he was not listed in the Top 10 in a Harris poll. A 2017 poll by Gallup found that soccer is nearly as popular as baseball with 7% of Americans saying it is their favorite sport, as opposed to 9% for baseball. Record men's soccer attendances in the U.S.
Record women's soccer attendances in the U.S. Many soccer matches in the United States draw large crowds, particularly international matches. A 2014 International Champions Cup match between Real Madrid and Manchester United at Michigan Stadium in Ann Arbor, Michigan had an attendance of 109,318, a record crowd for a U.S. soccer match. The 2009 Gold Cup quarterfinal matches drew over 82,000 to Cowboys Stadium (now known as AT&T Stadium). Between 2008–2011, the U.S. played three times in East Rutherford, New Jersey, drawing over 78,000 fans each game. The United States and Mexico national teams have been playing in front of crowds in excess of 60,000 in the U.S. in recent years. Also in recent years, many top-division European clubs—such as English clubs Manchester United and Chelsea, and Spanish clubs Real Madrid and Barcelona—have spent portions of their pre-season summer schedule playing matches in the United States. These matches have been highly attended events for U.S. stadiums. The 2009 World Football Challenge drew large crowds around the country, and Chelsea's four-game stint in the United States drew record crowds for a visiting foreign team. Nations from other regions have decided to organize tournaments in the U.S., given the growing soccer market in the country. For example, the 2014 Copa Centroamericana, a soccer competition for countries from Central America, was held in the U.S., due to the commercial appeal of the U.S. soccer market. Similarly, the 2016 Copa América was also held in the U.S., marking the first time that tournament took place outside of South America. The U.S. was selected to host for financial reasons, because "the market is in the United States, the stadiums are in the United States ... everything is in the United States." Furthermore, several nations schedule friendly matches to be held in the U.S. against opponents other than the U.S. national team. For example, the Mexico national team usually schedules several friendlies in the U.S. each year against various opponents. The El Salvador national team also regularly plays friendlies in the U.S., often in the Washington, D.C. area, home to a large Salvadoran community. The Brazil, Argentina, and Colombia national teams also play matches in the U.S. This is due to the fact that the U.S. has more adequate venues for competitions. U.S. television coverage and viewership of club and international soccer are at an all-time high. Mainstream sports networks ESPN, Fox Sports, and NBC Sports Network regularly provide coverage of soccer, as do several popular Spanish-language channels such as Telemundo, UniMás, and Galavisión. Additionally, the U.S. has several networks devoted mostly or completely to the sport, including Gol TV and beIN Sport USA. The size of the annual TV market in the U.S. for annual club soccer competitions was $126 million as of 2009. The club soccer competitions that generate the most annual revenue from TV audiences today in the United States are England's Premier League ($167m), Major League Soccer ($90m), the Mexican league ($50m), Spain's La Liga ($16m), and the UEFA Champions League ($10m). The most widely accessed televised soccer league in the United States is Mexico's Liga MX, which has most of its games televised live and free on television channels Azteca, Telemundo, UniMás and Univision. Fox began showing English Premier League matches on network TV in 2011, the first time that Premier League matches aired on U.S. broadcast TV. U.S. TV rights for the English Premier League were sold to NBC Sports in 2012 for $250 million for three years beginning with the 2013–14 season. Viewership for the Premier League's 2013-14 season on NBC Sports was 32 million, more than double the previous season. The Premier League earns higher ratings on NBCSN than the National Hockey League, despite the fact that the Premier League is shown in the morning while NHL games are in primetime. Major League Soccer has received broadcast fees from ESPN since 2008, and MLS signed a three-year deal in 2011 with NBC Sports to nationally televise 40 matches per year from 2012–2014. MLS has since then signed new television agreements with ESPN, FOX Sports, and Univision worth in total $90 million per year from 2015–2022. In addition, the 2010 UEFA Champions League final was broadcast live on the Fox Network, marking the first time that a soccer match between two European club teams was televised in the U.S. on English-language broadcast television. These TV networks also provide coverage of international soccer competitions, including the FIFA World Cup, the FIFA Women's World Cup, the CONCACAF Gold Cup, the UEFA European Championship, the FIFA Confederations Cup, and the U.S. men's national team, and women's national team matches. The Mexico national football team is also a popular team featured on Spanish language television and on ESPN. In addition to the World Cup, other international soccer competitions involving the U.S. team have become more popular among TV viewers. The 2007 CONCACAF Gold Cup attracted record television viewership, with the Univision telecast of the final between the United States and Mexico ranking as the third-most-watched Spanish-language program of all-time in the United States, beaten only by two FIFA World Cup finals matches. The 2009 Confederations Cup Final featuring the United States attracted 6.9 million viewers (including both the English and Spanish broadcasts). The 2013 World Cup qualifier between the U.S. and Mexico drew 7 million viewers, higher than the 5.8 million average viewers of the 2013 NHL Stanley Cup finals. Three 2013 Gold Cup matches were broadcast on the main Fox network channel, the first time since 2002 that a U.S. national team match outside of the World Cup was broadcast on network TV. TV networks in the U.S. have also begun showing international soccer tournaments that do not include the United States. Euro 2008 was shown on ESPN and ABC. Viewership for the Euro 2012 was 51% higher than 2008, with the 2012 final watched by over 4 million viewers. The viewership on ESPN of the group-stage matches of the 2013 Confederations Cup was 26% higher than the 2009 tournament, even though the U.S. did not play in the 2013 tournament. The rights to the two FIFA World Cups during the 2015–2022 timeframe also include rights to the two Women's World Cups and the two Confederations Cups during those years. The rights to the CONCACAF Gold Cup also include the rights to the CONCACAF Champions League. As of 2017[update], the most popular soccer event on television in the U.S. was the 2015 FIFA Women's World Cup Final. It was the most watched soccer match in American history with nearly 26.7 million combined viewers, more than the 2015 NBA Finals and Stanley Cup. It was also the most watched Spanish-language broadcast in tournament history. More than 750 million viewers were reported to have watched the match worldwide. The second highest viewership in the U.S. for a soccer match was 26.5 million combined viewers for Germany vs. Argentina in the 2014 FIFA World Cup Final. Previously, the 1999 FIFA Women's World Cup Final tallied 17.9 million viewers in the U.S. In 2005, the U.S. TV rights for the 2010 and 2014 World Cups were sold to ABC/ESPN and Univision for $425 million in "the biggest TV deal in a single country in FIFA's history." The telecasts of the 2006 FIFA World Cup Final attracted an estimated 17 million American viewers, higher than the 15.8 million average viewership of the 2006 World Series. The total TV viewership in the U.S. for all the matches including the final for the 2010 World Cup was 112 million viewers, a 22% increase over viewing numbers for the 2006 World Cup. The 2010 World Cup final game drew 24.3 million viewers in the United States, higher than the 14.3 million average viewership of the 2010 World Series. Landon Donovan's dramatic game-winning goal against Algeria that advanced the US team to the knockout stage of the 2010 World Cup resulted in jubilant celebrations across the United States. In 2011, the U.S. TV rights for the 2018 and 2022 World Cups were sold to Fox and Telemundo for a record $1.1 billion, more than any other country in the world, and 147 percent higher than the 2010 and 2014 TV rights. By 2014, the World Cup was considered an elite sports property on U.S. television. The USA-Portugal match during the 2014 World Cup registered 24.7 million viewers in the US, with 6.5 million viewers on Univision and 18.2 million viewers on ESPN, making it the most viewed program on ESPN, other than NFL or college football games, and eclipsing viewership numbers of other high-profile sports events such as MLB's World Series, the NBA Finals, and the NHL's Stanley Cup Finals. The 2014 FIFA World Cup also generated strong internet traffic, with the tournament generating more viewers via websites and apps than the 2012 Summer Olympics. Here are the complete tournament cumulative viewership totals for every World Cup tournament since 1994. These totals account for all matches played throughout the tournament. Since matches take place at different times, individual viewers will be counted multiple times. Only ESPN totals have been accounted for. Please find Spanish viewership as well. For context, the average number of viewers of that year's NFL Super Bowl is also provided. The total number of viewers in the United States who watched the World Cup final match are as follows. English and Spanish channel viewership along with internet viewership are accounted for in these statistics. For context, the average number of viewers of that year's MLB best-of-seven World Series are also provided. The following table shows the matches (other than a final match, which is shown in the table above) at the FIFA World Cup that scored the highest TV viewership. English and Spanish channel viewership (and internet viewership, where indicated) are accounted for in these statistics. All of the most-watched matches have taken place since 2010. The highest-rated U.S. World Cup matches have generally involved the U.S. national team. The following table shows the most-viewed international men's team matches other than World Cup matches. Both English and Spanish channel viewership are accounted for in these statistics. Sports television networks like ESPN, Fox Sports, NBC Sports and beIN Sports offer streaming services to cable/satellite television subscribers. Over-the-top streaming services like Sling TV, PlayStation Vue, DirecTV Now and YouTube TV also offer sports channels. In addition, Fox Soccer 2Go and FuboTV are soccer-specific over-the-top streaming services. The largest category of soccer in the United States in terms of participation is boys' and girls' youth soccer. Soccer is one of the most played sports by children in the United States. In 2012, soccer was the #1 most played team sport by high school boys, and soccer overtook softball to become the #3 most played team sport by high school girls. As of 2006, the U.S. was the #1 country in the world for participation in youth soccer, with 3.9 million American youths (2.3 million boys and 1.6 million girls) registered with U.S. Soccer. Among girls, the U.S. has more registered players than all other countries combined. The number of high school soccer players more than doubled from 1990 to 2010, giving soccer the fastest growth rate among all major U.S. sports. In recent decades, more youth sports organizations have turned to soccer as a supplement to American football, and most American high schools offer both boys and girls soccer. Due to the rising number of youths playing, the term "soccer mom" is used in American social and political discourse to describe middle- or upper-middle-class suburban women with school-age children. Americans between the ages of 12 and 24 rank professional soccer as their second favorite sport behind only American football. And in 2011, the FIFA video game ranked as the #2 most popular video game in the country, behind only Madden NFL. Though organized locally by organizations all over the United States, there are three main youth soccer club leagues working nationwide through affiliated local associations. The United States Youth Soccer Association boasts over three million players between the ages of five and 19, while American Youth Soccer Organization has more than 600,000 players between the ages of four and 19. Finally, the USL offers a number of youth leagues, including the Super-20 League and the Super Y-League, which have almost 1,000 teams and tens of thousands of players from the ages of 13 to 20. Also, the National Federation of State High School Associations features 800,000 soccer players. However, NFHS uses rules that are different from IFAB's. Major League Soccer (MLS) is the professional first-division league in the United States. It currently has 24 teams — 21 in the U.S. and 3 in Canada. With careful cost controls and the construction of soccer-specific stadiums, some MLS clubs became profitable for the first time in the mid-2000s, and Forbes magazine found that three clubs were already valued at $40 million or more, with the Los Angeles Galaxy worth $100 million. The establishment of the Designated Player Rule in 2007 has led to the signings of international superstars such as David Beckham and Thierry Henry, and Cuauhtémoc Blanco. Major League Soccer has been in an expansion phase, going from 10 teams in 2005 to 24 teams today, with plans to expand to 26 in 2020 and at least 27 in 2021. 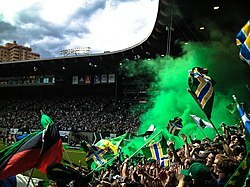 The league's 2007 and 2009 expansion to Toronto and Seattle, respectively, have proven highly successful, with league-leading ticket and merchandise sales, capped by sold-out attendances for friendlies against Real Madrid of Spain and Chelsea of England. In 2013, New York City FC agreed to pay a record $100 million expansion fee for the right to join MLS in 2015. This record was surpassed by the ownership groups of FC Cincinnati and a new Nashville team, which each paid $150 million to join MLS (FC Cincinnati in 2019 and Nashville in 2020). [a] The same amount was paid as an effective entrance fee by a group that bought Columbus Crew SC in 2018, which led to that team's previous operator receiving a new team in Austin, Texas that will join MLS in 2021. The league plans to expand to 27 teams with the addition of Inter Miami CF and Nashville SC in 2020 and Austin FC in 2021, with further plans to expand to 28 teams by 2022 and 30 teams at a later date. MLS has also announced the ownership groups of the 28th and 29th teams will each pay a $200 million entrance fee. MLS average attendance has been steadily growing, from 13,756 in 2000 to 22,113 in 2017. MLS has drawn a higher per-game attendance than NBA basketball and NHL hockey every year since 2011. Professional soccer has been less popular in the United States than most other parts of the world. Although MLS is also much younger than most other countries' first divisions, it is already the twelfth most-attended premier division in the world. MLS has announced its goal of developing into one of the top soccer leagues in the world by 2022. Unlike club football leagues in other countries, Major League Soccer does not have promotion and relegation, and instead utilizes a franchise system similar to other professional sports leagues in the country. In addition, Major League Soccer operates as a single entity, meaning that all clubs are owned by the league, with club investor-operators holding shares in the league itself rather than owning their teams directly, and all players being centrally contracted. Major League Soccer has faced criticisms for this structure, as well as other deviations such as scheduling matches during time periods designated by the FIFA Calendar for international play (which can affect the quality of MLS matches taking place within, although the league had been working to reduce the number of matches during these windows). However, it has also been noted that the league's salary caps have helped to discourage rampant spending, allowing for steadier long-term growth. The North American Soccer League (NASL) has repeatedly accused Major League Soccer of having a monopoly position being defended by the United States Soccer Federation, such as accusing the USSF of proposing to change the minimum criteria for a Division I league to include specifications that only MLS could currently meet, such as minimum stadium capacities and requiring at least 75% of teams to be in metropolitan areas with a population of at least 2 million. As of the current 2019 season, the second tier of North American soccer is occupied by the USL Championship, rebranded from the United Soccer League after the 2018 season. This league received provisional sanctioning by U.S. Soccer before the 2018 season. The current iteration of the North American Soccer League had functioned at the second level under provisional status through the 2017 season, but more recent developments have left the league's survival in serious doubt. The new North American Soccer League was formed in late 2009, with plans to launch in the 2010 season, by disgruntled team owners from the USL First Division, after Nike sold its stake in the latter league's parent corporation, then known as the United Soccer Leagues and now as the United Soccer League (USL). U.S. Soccer refused to sanction either the First Division or the new NASL for 2010, and the two groups eventually agreed to unite for 2010 only under the banner of USSF Division 2, run directly by U.S. Soccer and including teams from both leagues. U.S. Soccer initially sanctioned the new NASL in November 2010, revoked its sanctioning in January 2011 due to financial issues surrounding the ownership of several teams, and re-sanctioned it in February 2011. The NASL launched in 2011 with eight teams—five on the U.S. mainland, one in Puerto Rico (a U.S. commonwealth that has its own national federation), and two in Canada. One of the Canadian teams left the NASL after the 2011 season to enter MLS; the league remained at eight teams for 2012 as San Antonio Scorpions FC joined NASL. In 2013, a new version of the New York Cosmos joined the NASL. Ottawa Fury FC and Indy Eleven joined in 2014. Three teams were set to join the league in 2015—Jacksonville Armada FC, Virginia Cavalry FC, and Oklahoma City FC—but only the Jacksonville team actually began play. Virginia Cavalry is no longer listed as a future team on the NASL website; Oklahoma City FC was bought by the owner of Spanish club Rayo Vallecano and rebranded as Rayo OKC, which began play in 2016. Two other teams, Miami FC and Puerto Rico FC, were launched in 2016, with Miami starting play in the league's spring season and Puerto Rico in the fall season. At the same time, the Atlanta Silverbacks self-relegated to the lower-level National Premier Soccer League and the San Antonio Scorpions folded. After the 2016 season, Minnesota United left for MLS, Rayo OKC folded, and Ottawa Fury FC and the Tampa Bay Rowdies left for the USL. Since then, the NASL has experienced even more instability. The San Francisco Deltas joined for the 2017 season but folded after that season despite winning the league's title. During that offseason, after the USSF pulled the NASL's provisional Division II status due to not meeting its criteria, the NASL filed an antitrust lawsuit against the USSF. The NASL accused the USSF of colluding with Major League Soccer to protect its status as the sole top-flight soccer league in the United States, citing a relationship under which MLS clubs are required to maintain affiliations or co-owned reserve teams in the USL. The suit was not supported by all of the league's teams; FC Edmonton was not involved in the action (and would cease professional operations due to the uncertainty stemming from the lawsuit[b]), and North Carolina FC did not support the suit. While the league added two teams for 2018 in California United FC and San Diego 1904 FC, it lost four teams—the aforementioned San Francisco Deltas, FC Edmonton and NCFC, plus Indy Eleven; the last two of these teams moved to the USL. Due to the ongoing litigation, the NASL canceled its 2018 spring season, though choosing to frame it as a change to a fall-to-spring schedule spanning two calendar years. After a federal court denied an injunction that would have maintained the NASL's second-division status, the league announced that it would also not play a 2018 fall season. Following the USL–NASL feud and a subsequent tightening of U.S. Soccer standards for owners of second-division teams, the USL folded its First and Second Divisions into a new third-level league originally known as USL Pro, later as the United Soccer League, and now as the USL Championship. The league launched in 2011 with 15 teams–11 on the U.S. mainland, three in Puerto Rico, and one in Antigua and Barbuda—but due to issues with the health and finances of two of the Puerto Rican owners, the Puerto Rican teams were dropped from the league shortly after the beginning of its first season. One of the U.S.-based teams folded following the 2011 season; two new U.S.-based teams joined the league in 2013. In that same year, MLS and USL Pro entered into a formal agreement that eventually merged the MLS Reserve League into the USL Pro structure. Each MLS team is now required to field a reserve team in a USL league, either by operating a standalone team or affiliating with an independently owned team. After the 2013 season, the Antigua and Barbuda team folded, as well as one U.S.-based team. In addition, one U.S.-based team left the league but was replaced by a new team in the same area; and three completely new teams entered the league for 2014. One of the new teams was an MLS reserve side. The 2015 season, which coincided with the rebranding of the competition as the United Soccer League, saw a major expansion. Three teams left the league, but 13 new teams entered, bringing its membership to 24. Orlando City moved to MLS, and two other teams, the Charlotte Eagles and Dayton Dutch Lions, relegated themselves to the PDL. Two of the three departing teams were replaced by new franchises; the Eagles' franchise rights were acquired by a local group that launched the Charlotte Independence, and Louisville interests bought Orlando City's USL franchise rights and launched Louisville City FC. Both of these clubs became affiliates of MLS teams, respectively the Colorado Rapids and Orlando City. Seven MLS teams—the Montreal Impact, New York Red Bulls, Portland Timbers, Real Salt Lake, Seattle Sounders, Toronto FC, and Vancouver Whitecaps—began fielding team-operated reserve sides in the USL. The Orlando City–Louisville affiliation was only for the 2015 season, as Orlando City launched Orlando City B, its own USL reserve side, in 2016. The USL expanded to 29 teams in 2016. While Austin Aztex went on hiatus for that season while seeking to build a new stadium, six new teams were launched. Three are operated by MLS teams—Orlando City B, Bethlehem Steel FC (Philadelphia Union), and Swope Park Rangers (Sporting Kansas City). The other three are FC Cincinnati and San Antonio FC, neither of which had an MLS affiliation, and the Rio Grande Valley FC Toros. The Toros are the first USL team with a so-called "hybrid affiliation" with an MLS team; the Houston Dynamo selects players and coaches, while the separate Toros ownership group runs all business affairs. In 2017, the USL expanded to 30 teams. The Aztex ultimately folded without building a new stadium, and two other teams from the 2016 season did not play in 2017. The Wilmington Hammerheads self-relegated to the USL's Premier Development League (PDL), now known as USL League Two, and the Montreal Impact folded FC Montréal in favor of an affiliation with the incoming Ottawa Fury FC. At the same time, three new teams entered the league, with Ottawa Fury FC and the Tampa Bay Rowdies joining from the NASL, and the completely new Reno 1868 FC competing as a hybrid affiliate of the San Jose Earthquakes. U.S. Soccer awarded the USL provisional second-level status for the 2017 season alongside the NASL. Further USL expansion has been announced for 2019 and beyond. With the folding of one team, the departure of two, and the addition of six, the league featured 33 teams in its 2018 season. Permanently departing was Whitecaps FC 2, which was folded by its MLS parent, the Vancouver Whitecaps. Orlando City B and the Rochester Rhinos went on hiatus, but eventually chose not to return to the USL's top flight. Of the six new USL teams for 2018, four were new sides—Atlanta United 2 (owned by Atlanta United FC), Fresno FC (which took over the Whitecaps affiliation), Las Vegas Lights FC, and Nashville SC. The other new USL teams were former NASL sides Indy Eleven and North Carolina FC. The following year saw four teams leave the rebranded USL Championship and seven new teams join. The departing teams were FC Cincinnati, which joined MLS; the Richmond Kickers and Toronto FC II, both of which became founding members of USL League One, a third-level league that began play in 2019; and the Harrisburg, Pennsylvania-based Penn FC, which suspended professional operations for 2019 before resuming play in League One in 2020. In addition, both clubs that had gone on hiatus after the 2017 USL season would later announce moves to League One. Orlando City B resumed play alongside Toronto FC II as an inaugural League One team, while the Rochester Rhinos will not resume professional operations until joining League One in 2020. The teams that began play in the USL Championship in 2019 are Austin Bold FC (replacing the Aztex), Birmingham Legion FC, El Paso Locomotive FC, Hartford Athletic, Loudoun United FC, Memphis 901 FC, and New Mexico United. Of these new sides, one is an MLS reserve team, namely Loudoun United, which replaced the Richmond Kickers as the D.C. United reserve side. Nashville SC will cease USL operations after the 2019 season, with the club name to be assumed by a new MLS team. Teams in Chicago and California's East Bay are currently set to launch in 2021. The United Soccer League operates four leagues in all, spanning the lower divisions of men's professional soccer, as well as youth soccer; it has operated women's leagues in the past. The most recent addition to the USL lineup is USL League One, a third-level men's league that began play in 2019. Below the USL Championship and League One is the country's semi-professional fourth-division league, USL League Two (formerly the Premier Development League), which has (as of the 2019 season) 69 teams in the U.S. and five in Canada (the league has also previously had a team in Bermuda). Though League 2 does have some paid players, it also has many teams that are made up entirely or almost entirely of college soccer players who use the league as an opportunity to play competitive soccer in front of professional scouts during the summer, while retaining amateur status and NCAA eligibility. The Lamar Hunt U.S. Open Cup is a knockout tournament in American soccer. The tournament is the oldest ongoing national soccer competition in the U.S. and was historically open to all United States Soccer Federation affiliated teams, from amateur adult club teams to the professional clubs of Major League Soccer. Since the 2016 edition, professional teams that are majority-owned, or whose playing staff is managed, by a higher-division outdoor professional team have been barred from the competition; all other U.S. Soccer-affiliated teams remain eligible to enter. The Open Cup was first held in 1913–14 when it was called the National Challenge Cup. The overall league structure in the United States is significantly different from that used in almost all the rest of the world, but similar to that used by other American team sports leagues, in that there is no system of promotion and relegation between lower and higher leagues, but rather a minor league system, generally the same as almost all other top-level pro sports leagues in North America. In addition, teams playing in American soccer leagues are not private clubs founded independently of the league that join a league in order to ensure regular fixtures but are instead usually franchises of the league itself. Finally, the soccer leagues in the United States also incorporate features common to other American sports leagues, most notably the determination of champions by playoffs between the top teams after the conclusion of a league season. MLS formerly had a balanced schedule and prior to then used an unbalanced schedule. However, due to MLS's recent expansion, the league has returned to an unbalanced schedule. However, in several ways, American soccer leagues have become more similar to leagues in the rest of the world in recent years. MLS and all USL leagues now allow games to end in ties, which were initially avoided via a penalty shootout if scores were level at the end of play. This was done to avoid alienating mainstream American sports fans, who are not accustomed to tie games, but actually had the unintended consequence of alienating soccer purists who saw the change as an "Americanization" of the sport. MLS began allowing ties in the 2000 season. Additionally, MLS and USL leagues now use upward-counting clocks that do not stop for stoppages in play, and instead add on time before halftime and full-time. A downward-counting clock that stops for dead balls and ends the game when it reaches zero is still in use in American high school and college soccer, as well as most other American sports, but was and is completely foreign to soccer played outside the United States. MLS adopted the international clock in 2000. Finally, until 2007, the front of teams' shirts in MLS and USL leagues did not bear advertisements, as commercial uniform sponsorship is uncommon in American sports. However, starting in the mid-2000s, clubs were allowed to accept corporate sponsorship on the front of their shirts. Women's soccer in the United States has been played at the professional level since 2001. As a result of the U.S. women's national team's (USWNT) first-place showing in the 1999 FIFA Women's World Cup, a seemingly viable market for the sport germinated. Feeding on the momentum of their victory, the eight-team league formed in February 2000, the U.S. Soccer Federation approved membership of the Women's United Soccer Association (WUSA) as a sanctioned Division 1 women's professional soccer league on August 18, 2000, and the league began playing its first season in April 2001. It would be the world's first women's soccer league in which all the players were paid as professionals. The WUSA had previously announced plans to begin to play in 2001 in eight cities across the country, including: Atlanta, the Bay Area, Boston, New York, Orlando, Philadelphia, San Diego and Washington, D.C. The WUSA forged ahead on a cooperation agreement that would see the new league work side-by-side with Major League Soccer to help maximize the market presence and success of both Division I leagues. The eight teams included the Atlanta Beat, Boston Breakers, Carolina Courage, New York Power, Philadelphia Charge, San Diego Spirit, San Jose CyberRays (called Bay Area CyberRays for 2001 season), and the Washington Freedom. The WUSA played for three full seasons. The WUSA suspended operations, however, on September 15, 2003, shortly after the conclusion of the third season, due to financial problems and lack of public interest in the sport. With the WUSA on hiatus, the Women's Premier Soccer League (WPSL) and the W-League regained their status as the premier women's soccer leagues in the United States, and many former WUSA players joined those teams. The Washington Freedom was the only WUSA team to continue operations after the league dissolved (although new versions of the Atlanta Beat and Boston Breakers formed in 2009) and eventually became a part of the W-League in 2006. After the folding of WUSA, WUSA Reorganization Committee was formed in September 2003 that led to the founding of Women's Soccer Initiative, Inc. (WSII), whose stated goal was "promoting and supporting all aspects of women's soccer in the United States", including the founding of a new professional league. Initial plans were to play a scaled-down version of WUSA in 2004. However, these plans fell through and instead, in June 2004, the WUSA held two "WUSA Festivals" in Los Angeles and Blaine, Minnesota, featuring matches between reconstituted WUSA teams in order to maintain the league in the public eye and sustain interest in women's professional soccer. A planned full relaunch in 2005 also fell through. In June 2006, WSII announced the relaunch of the league for the 2008 season. In December 2006, WSII announced that it reached an agreement with six owner-operators for teams based in Chicago, Dallas, Los Angeles, St. Louis, Washington, D.C., and a then-unnamed city. In September 2007, the launch was pushed back from Spring of 2008 to 2009 to avoid clashing with 2007 Women's World Cup and the 2008 Olympic Games and to ensure that all of the teams were fully prepared for long-term operations. The name for the new professional league, along with its logo, was announced on January 17, 2008. The league was to have its inaugural season in 2009, with seven teams, including the Washington Freedom, a former WUSA team. Twenty-one U.S. national team players were allocated to each of the seven teams in September 2008. Also in September, the league held the 2008 WPS International Draft. Unlike WUSA, the WPS took "a local, grassroots approach", and "a slow and steady growth type of approach," In addition, the WPS attempted to have a closer relationship with Major League Soccer in order to cut costs. Most teams considered the first season a moderate success, despite many losing more money than planned. However, most teams began to see problems in 2010. Overall attendance for 2010 was noticeably down from 2009, teams were struggling with financial problems, and the WPS changed leadership by the end of the season. The success of the United States women's national soccer team at the 2011 FIFA Women's World Cup resulted in an upsurge in attendance league-wide as well as interest in new teams for the 2012 season. However, several internal organization struggles, including an ongoing legal battle with magicJack-owner Dan Borislow, and lack of resources invested in the league lead to the suspension of 2012, announced in January 2012. On May 18, 2012, the WPS announced that the league had officially ceased operations, having played for only three seasons. By this time, the WPSL and W-League were the two semi-pro leagues in the United States and had sat under WUSA and the WPS until 2012. Upon the disbandment of the WPS, they once again regained their status as the premier women's soccer leagues in the United States. In response to the suspension and eventual end, of the WPS, the Women's Premier Soccer League created the Women's Premier Soccer League Elite (WPSL Elite) to support the sport in the United States. For the 2012 season, the league featured former WPS teams, Boston Breakers, Chicago Red Stars, and Western New York Flash, in addition to many WPSL teams. Six of the eight teams were considered fully professional. Many members of the USWNT remained unattached for the 2012 season while others chose to play in the W-League instead of the WPSL Elite. After the WPS folded in 2012, the United States Soccer Federation (USSF) announced a roundtable for the discussion of the future of women's professional soccer in the United States. The meeting resulted in the planning of a new league set to launch in 2013 with 12-16 teams, taking from the WPS, the W-League, and the WPSL. The league was officially announced by U.S. Soccer on November 21, 2012, with the Canadian Soccer Association (CSA) and Mexican Football Federation (FMF) also participating in the announcement. The league was ultimately called the National Women's Soccer League (NWSL). Teams in the NWSL are privately owned, but national federations are heavily involved in league financing and operations. All three federations initially paid salaries for many of their respective national team members. U.S. Soccer committed to funding up to 24 national team members, with the CSA committing to paying 16 players and FMF pledging support for 12 to 16 (ultimately 16). This freed each of the eight charter teams from having to pay salaries for up to seven players. In addition, U.S. Soccer hosts the new league's front office, and is scheduling matches to avoid conflicts with international tournaments. Today, only U.S. Soccer and the CSA still provide support (including allocating players) to the NWSL; FMF and NWSL ended their relationship (presumably amicably) in 2017, when FMF launched its own national women's league, Liga MX Femenil. Four of the league's charter teams had WPS ties—the Boston Breakers, Chicago Red Stars, a revival of the New Jersey-based Sky Blue FC, and the Western New York Flash. The other four were in Kansas City, Portland, Seattle, and Washington, D.C., with the Portland team being run by the Portland Timbers. The league added its second MLS-linked team in 2014 with the entry of the Houston Dash, run by the Houston Dynamo and playing in the Dynamo's stadium. A third NWSL team, FC Kansas City, announced a partnership with Sporting Kansas City in 2015; although the two clubs continued to be separately owned, FC Kansas City would use Sporting's facilities for practices and home games. Another MLS-linked team joined the league in 2016 with the arrival of the Orlando Pride, operated by Orlando City SC. The 2016–17 offseason saw the league's first major relocation, with the Flash selling their NWSL franchise rights to the owner of North Carolina FC, then playing in the NASL and now in the USL Championship, who moved the NWSL team to the Research Triangle of North Carolina and relaunched it as the North Carolina Courage. The NWSL became the first professional women's league to reach more than eight teams with the addition of the Houston Dash and Orlando Pride (10 teams in the league in 2016 and 2017) and the first to sustain more than three years of operations. In 2017, A&E Networks bought an equity stake in the league and broadcasts a game of the week on Lifetime and streams all games online via the go90 platform. Following the 2017 season, FC Kansas City folded. The team was seen by media as an unintended victim of issues that Sporting was facing with its USL reserve team, Swope Park Rangers. Kansas City's place in the NWSL was immediately filled by a new franchise to be operated by another MLS club, Real Salt Lake; the new team was unveiled shortly thereafter as Utah Royals FC. In January 2018, the league dropped to 9 teams with the demise of the Boston Breakers, which had been the only team to have participated in every previous season of U.S. top-flight professional women's soccer. Originally called the United States Interregional Women's League, the W-League was formed in 1995 to provide a professional outlet for many of the top female soccer players in the country. Starting as the Western Division of the W-League, the Women's Premier Soccer League (WPSL) broke away and formed its own league in 1997 and had its inaugural season in 1998. Both the W-League and the WPSL were considered the premier women's soccer leagues in the United States at the time but eventually fell to a "second-tier" level upon the formation of the Women's United Soccer Association. The W-League grew as large as 41 teams in 2008, but its membership fell rapidly from that point on, and the league folded after its 2015 season. Of the 18 teams that competed in the final season of the W-League, seven joined the WPSL, and eight formed a new second-level league, United Women's Soccer (UWS). This new league ultimately launched in 2016 with 11 teams, including six of the founding members (the other two, both Canadian teams, were denied licenses by the Canadian Soccer Association). UWS expanded to 21 teams, including one new Canadian side, in 2017. The United States men's and women's national soccer teams represent the United States in international competition. The men's national team competes in the FIFA World Cup and the FIFA Confederations Cup, in addition to the CONCACAF Gold Cup and other competitions by invitation. The U.S. national team had some success in early FIFA World Cup tournaments. The U.S. finished third in the World Cup in 1930, and played in the 1934 World Cup. The next World Cup participation came in the 1950 World Cup, where they upset England 1-0 in group play. After 1950, the USA did not return to the World Cup for another 40 years. The fortunes of the U.S. national team changed in the 1990s, with the team participating in every World Cup between 1990 and 2014. The U.S. hosted the 1994 World Cup, beating Colombia to reach the knockout rounds, before losing to Brazil in the round of sixteen. The team reached the quarter-finals of the 2002 World Cup by defeating its rival Mexico. The U.S. team also accomplished another first by winning its group at the 2010 World Cup. The U.S. national team participated in the 2009 FIFA Confederations Cup. The U.S. defeated #1 ranked Spain in the semifinals, before losing to Brazil 3-2 in the final. On the regional stage, the national team has also improved, with a record up to 2013 of reaching the final of the biannual CONCACAF Gold Cup nine times since 1989, winning it six times: 1991, 2002, 2005, 2007, 2013, 2017. The Women's National Soccer Team of the 1900s were the first women's national team in the United States. They competed in the FIFA Women's World Cup, the Summer Olympics, and the Algarve Cup, in addition to the CONCACAF Women's Gold Cup and other competitions by invitation. The United States women's team has been one of the best national teams in the history of women's soccer, having won three World Cups (in 1991, 1999, and 2015). They also won four Olympic gold medals (in 1996, 2004, 2008, and 2012), and 10 Algarve Cups (in 2000, 2003, 2004, 2005, 2007, 2008, 2010, 2011, 2013, and 2015). Following their 2015 World Cup victory, the USWNT regained the top spot in the FIFA Women's World Rankings from Germany; they have held the top spot for the majority of the time since the rankings began in 2003, and have never been lower than second. For as much as the rest of the world loves soccer, it has been much slower to embrace the women's game than the U.S. In England, women playing soccer was effectively banned (at least at venues that hosted men's teams) from 1921 to 1971, and in Germany it was banned from 1955 to 1970. At around the time Title IX was heating up in the United States, women's international soccer basically didn’t exist. According to FIFA, there were only three national teams and two international matches played in 1971. Additionally, in the years following Title IX, American high schools and colleges have been steadily embracing girls' and women's soccer. According to the National Federation of State High School Associations (NFHS), the U.S. had little more than 10,000 girls playing high school soccer in the late 1970s. This number had increased to 120,000 by 1991 when the USWNT claimed its first World Cup title, and 250,000 by 1999, the year of the second World Cup title. In 2015, there were about 375,000 girls playing high school soccer, making up 47% of all high school soccer players, and soccer has recently surpassed softball as the third-most-played girls' team sport. At the college level, 53% of all NCAA soccer players are women, and this percentage rises to 61% at the highest level, Division I. Another contributing factor is the role of women within American society, which includes relative equality (especially rejecting hardened gender roles) for women in the United States relative to many other countries. This is also reflected in official government policy regarding women in athletics, specifically the landmark Title IX legislation, which broadly requires any educational institution that receives federal government funds to support men's and women's educational programs equally, thus including athletics. America's approach to growing the game among women has served as a model for other countries' development programs for women at all levels. However, the FiveThirtyEight story suggested that the U.S. does not take adult women's soccer as seriously as some other countries, notably Germany. On a per capita basis, the U.S. and Germany have essentially identical participation among girls. However, the two countries differ greatly in the age profile of their registered female players. Nearly 95% of registered female players in the U.S. are youths, as opposed to 31% in Germany. In turn, this leads to Germany having more than six times the number of serious adult female players as the U.S. (about 650,000 to 100,000). In the United States, college soccer is featured in many collegiate athletic associations including the NCAA, the NAIA, the NCCAA, and the USCAA. Many top American college soccer players play for separate teams in USL League Two during the summer. The NCAA Division I Men's Soccer Championship, the semifinals and finals of which are known as the College Cup, is an American intercollegiate college soccer tournament conducted by the NCAA and determines the Division I men's national champion. The tournament has been formally held since 1959, when it crowned Saint Louis University as the inaugural champion. The tournament's current format involves 48 teams, in which every Division I conference tournament champion is allocated a berth. Since its inception, Saint Louis (10 titles), Indiana (8 titles), and Virginia (6 titles) have historically been the most successful Division I schools. Indiana has appeared in more College Cups (18) and has a higher winning percentage in post-season play (.768) than any other school in Division I soccer. Since the early 1990s, several Americans have found opportunities playing soccer at the highest levels of foreign leagues. Among the first Americans to become regulars in foreign leagues were John Harkes at Sheffield Wednesday and Derby County in England, Eric Wynalda at Saarbrücken in Germany, and Kasey Keller at Millwall F.C. in England. Since then, other Americans have played for clubs that have participated in the knockout rounds of the Champions League and Europa League, such as Brad Friedel with Tottenham, DaMarcus Beasley with PSV Eindhoven, and Christian Pulisic with Borussia Dortmand. The following national teams of U.S. unincorporated territories compete in their corresponding regions. Their governing bodies are either members or associates in the corresponding regional federations. For all but American Samoa, players for these territories are, like most local residents, U.S. citizens. Natives of American Samoa are U.S. nationals, but not U.S. citizens (unless they have a citizen parent). ^ FC Edmonton eventually announced in 2018 that it would resume professional operations and join the Canadian Premier League for its inaugural 2019 season. ^ a b "Member Association - USA". FIFA.com. ^ a b c d e f g h "All-Time Largest Crowds to Watch Women's Soccer in the United States". U.S. Soccer. Retrieved June 27, 2017. ^ Johnson, Alex (May 27, 2015). "Soccer by the Numbers: A Look at the Game in the U.S." NBC News. Retrieved June 27, 2017. ^ "Football Still Americans' Favorite Sport to Watch". gallup.com. ^ a b Roepken, Corey (October 6, 2016). "Former players encouraged by women's soccer league's progress". Houston Chronicle. Retrieved June 27, 2017. ^ Hays, Graham (April 16, 2017). "Five observations as the NWSL kicks off its fifth season". ESPN. Retrieved June 27, 2017. ^ "NWSL embarks on its 5th season with new TV deal, new star". USA Today. April 13, 2017. Retrieved June 27, 2017. ^ "A+E buys stake in NWSL, will televise games on Lifetime". USA Today. February 2, 2017. Retrieved June 27, 2017. ^ Musarurwa, Kudzi (April 13, 2017). "NWSL announce partnership with go90". Vavel. Retrieved June 27, 2017. ^ Goldberg, Jamie (July 2, 2018). "NWSL will stream games on website in August and September after go90 shuts down". The Oregonian. Retrieved November 9, 2018. ^ Sandomir, Richard (July 6, 2015). "Women's World Cup Final Was Most-Watched Soccer Game in United States History" – via www.nytimes.com. ^ Mazumdar, Partha (June 5, 2006). "The Yanks are Coming: A U.S. World Cup Preview". Embassy of the United States in London. Archived from the original on August 21, 2009. Retrieved June 6, 2009. ^ Crawford, Scott (2013). A History of Soccer in Louisiana: 1858–2013. New Orleans: laprep Soccer Publishing Co. ISBN 1489521887. ^ Woosnam, Phil (1972). Sports Illustrated Soccer (1st ed.). J.B. Lippincott Company. p. 9. ISBN 0-397-00908-9. Accessed 6 October 2016. ^ Roger Allaway (February 14, 2001). "Were the Oneidas playing soccer or not?". Retrieved June 25, 2007. ^ Allaway, Roger West Hudson: A Cradle of American Soccer. ^ "FIFA Women's World Cup – USA 1999". FIFA. Retrieved August 27, 2014. ^ "Survey says: Twenty insights from poll's 20 years", Sports Business Journal, January 6, 2014. ^ Inc., Gallup,. "Football Still Americans' Favorite Sport to Watch". Gallup.com. Retrieved June 8, 2018. ^ a b c d e "Man United win in front of 109,318", ESPN FC, August 2, 2014. ^ "Real Madrid vs. Chelsea - Football Match Summary - July 30, 2016 - ESPN", July 30, 2016. ^ "Manchester United vs. Liverpool - Football Match Summary - July 28, 2018 - ESPN", ESPN FC, July 28, 2018. ^ "Man United win in front of 109,318". ESPN. August 2, 2014. ^ "Chelsea wraps up U.S. tour with WFC title". ESPN FC. July 26, 2009. ^ "El Salvador será sede eliminatorio UNCAF" (in Spanish). fesfut.org.sv. January 29, 2014. Retrieved January 29, 2014. ^ "Tricolores, sin restricciones" (in Spanish). elsiglodedurango.com. February 9, 2012. Retrieved February 25, 2012. ^ "Premier League set for US big screens", Yahoo, July 23, 2014. ^ "Soccer Myths in America", Washington Post Express, page 9, July 11, 2014. ^ "NBC Retains Rights to Premier League in Six-Year Deal", New York Times, August 10, 2015. ^ "Univision Deportes' Broadcast of Liga MX is the Most-Watched Club Soccer League Across All Networks Regardless of Language", TV by the Numbers, December 4, 2014. ^ "2013-14 UEFA CHampions League TV Ratings on FS1", Clever Through Balls, May 5, 2014. ^ "ESPN's USA-Brazil Numbers (continued)". The Washington Post. Retrieved May 23, 2010. ^ "TV networks hope to ride soccer surge", Tampa Bay Times, July 15, 2014. ^ "Television Audience Report", FIFA Women's World Cup, Germany 2011. ^ "Final Matches of the Confederations Cup Score Top Ratings for Univision Networks", TV By The Numbers, July 1, 2013. ^ "ESPN's UEFA Euro 2012 Audience up 51 Percent vs. 2008", TV By The Numbers, July 3, 2012. ^ "Univision, US Men's National Team Big Winners at CONCACAF Gold Cup Soccer Tourney", TV By The Numbers, July 30, 2013. ^ a b c Sandomir, Richard (July 6, 2015). "Women's World Cup Final Was Most-Watched Soccer Game in United States History". The New York Times. Retrieved June 27, 2017. ^ a b "Women's World Cup Final Is Most-watched Soccer Match in U.S. History". U.S. Soccer. July 8, 2015. Retrieved June 27, 2017. ^ Hinog, Mark (July 6, 2015). "More Americans watched the Women's World Cup final than the NBA Finals or the Stanley Cup 24". SB Nation. Retrieved June 27, 2017. ^ "Record-breaking FIFA Women's World Cup tops 750 million TV viewers". FIFA. December 17, 2015. Retrieved June 27, 2017. ^ Sailer, Steve (July 17, 2006). "One World Cup". The American Conservative. Retrieved May 25, 2012. ^ "World Cup Final Ratings: 24.3 Million Viewers In US For Record". Huffington Post. July 13, 2010. ^ a b "Bigger Than Baseball: 25 Million Watch U.S.-Portugal World Cup Match", New York Times, June 23, 2014. ^ a b "World Cup: USMNT-Portugal is the most watched soccer match ever in US", Soccer By Ives, June 23, 2014. Viewers included 18.2 million on ESPN, 6.5 million on Univision, and more than 1 million on WatchESPN. ^ "Americans Go Digital for World Cup Experience in Record Numbers", Soccer By Ives, July 2, 2014. ^ a b c d "ABC Posts 8.6 Overnight Nielsen Rating For World Cup Final - SportsBusiness Daily - SportsBusiness Journal - SportsBusiness Daily Global". m.sportsbusinessdaily.com. ^ a b Sandomir, Richard (July 11, 2006). "Cup Ratings Are Up, but Fans Deserve Better". The New York Times. ^ a b "Quick Takes: World Cup final sets U.S. ratings record". Los Angeles Times. July 13, 2010. ^ "Global Broadcasters Score Big With Live World Cup Final Ratings". Variety. July 18, 2018. Retrieved July 21, 2018. ^ "World Cup: USMNT game against Belgium was highest-rated soccer match ever on cable", MLS Soccer, July 2, 2014. TV viewership was 16.5m on ESPN and 5.1m on Univision. Internet viewership was 1.5m on WatchESPN and 1.8m on Univision. ^ "16 Million Americans Watch USA-Ghana Match on TV, Set Record for ESPN", Soccer By Ives, June 18, 2014. ^ "World Cup: Ratings are in, USA-Ghana second highest group stage match ever in US", MLSsoccer.com, June 17, 2014. ^ "World Cup Ratings Update: Univision Hits Highest Viewership Ever With Mexico Vs. Netherlands Game", June 30, 2014. Viewership was 10.4m Univision and 6.6m ESPN. ^ "World Cup TV Ratings: USA/Germany Tops 14M Despite Noon Start", Sports Media Watch, June 27, 2014. Viewership included 10.8m on ESPN and 3.4m on Univision. ^ "ESPN Sets Online Streaming Records in U.S. vs. Germany World Cup Soccer Match". Home Media Magazine. June 27, 2014. , 2.5 Million online viewers 1.7 on WatchESPN and 750,000 on Univision Digital. ^ "World Cup Ratings: ESPN and Univision Wrap Strong Semifinals", July 10, 2014. ^ "Univision Deportes Delivers its Most-Viewed World Cup Semifinal Matches Ever", July 10, 2014. Univision viewership 5.4m, online viewership 1.2m. ^ "Netherlands-Argentina: ESPN's Highest-Rated and Most-Viewed FIFA World Cup Semifinal Match" ESPN broadcast viewership 6.8m, WatchESPN online viewership 2.4m. ^ "1.3 Million Viewers Watch Brazil-Spain Confederations Cup Final On ESPN", July 2, 2013. ^ "Final Matches of the Confederations Cup Score Top Ratings for Univision Networks", July 1, 2013. ^ "Gold Cup Final Beats MLB Tatings This Weekend". July 30, 2013. ^ "Univision Delivers Historic Ratings with CONCACAF Gold Cup Semifinal Reaching 10.9 Million viewers". June 24, 2011. ^ "ESPN Grows Audience for FIFA Women's World Cup; USA - Brazil: Third Most-Viewed FIFA Women's World Cup Match Ever", TV by the Numbers, July 12, 2011. ^ "(Women's) Soccer Nation: USA-Japan World Cup Final Averages Record-setting 25.4 Million Viewers on Fox". July 6, 2015. ^ "USA-Germany Women's World Cup averages 8.4 million viewers on Fox, peaks with 12.1 million", Sports TV Ratings, July 1, 2015..
^ "USA-China Women's World Cup match averages 5.7 million viewers on Fox, 3rd Most-Watched All-time", Sports TV Ratings, June 27, 2015. ^ "USA-Colombia Peaked with 6.4 million, St. Louis top local market", Sports TV Ratings, June 23, 2015. ^ "USA-Nigeria Women's World Cup match averages 5.043 million viewers on Fox". June 17, 2015. ^ "TV Ratings Friday: Women's World Cup Wins Night, 'Whose LIne Is It Anyway' & 'What Would You Do?' Down, 'The Messengers' Flat". June 13, 2015. ^ a b c d e Morris, Benjamin (June 30, 2015). "Why Is The U.S. So Good At Women's Soccer?". FiveThirtyEight. Retrieved July 3, 2015. ^ "At a Glance - US Youth Soccer". US Youth Soccer. ^ "2014-15 NFHS Participation Survey Results" (PDF). ^ Schwartz, Peter J.; Badenhausen, Kurt (September 9, 2008). "Major League Soccer's Most Valuable Teams". Forbes. ^ "Sounders FC fall to Chelsea at sold out Qwest". MLSnet.com. ^ "Miami MLS expansion team to begin play in 2020". MLSSoccer.com. MLS Digital. January 29, 2018. Retrieved March 28, 2019. ^ "Austin FC to Begin Play in MLS in 2021". MLSSoccer.com (Press release). MLS Digital. January 15, 2019. Retrieved February 11, 2019. ^ a b "MLS announces plans to expand to 30 teams". MLSsoccer.com. April 18, 2019. Retrieved April 18, 2019. ^ "Get the boot". Bleacher Report. August 2012. ^ May, John (July 18, 2007). "Beckham in Mission Unnecessary". BBC. ^ Parker, Graham (October 18, 2012). "Who earns the big bucks in MLS? And why the players want us to know". the Guardian. Retrieved June 25, 2018. ^ Goff, Steven (August 29, 2016). "In defying FIFA calendar, MLS continues to damage itself". Washington Post. ISSN 0190-8286. Retrieved June 25, 2018. ^ "MLS stands alone as a closed shop in the world of football. Meet the two men trying to change that". The Independent. Retrieved June 21, 2018. ^ "Detroit and Major League Soccer: What went wrong". Crain's Detroit Business. June 3, 2018. Retrieved June 21, 2018. ^ "MLS Has A 2022 Problem". Vice Sports. June 16, 2016. Retrieved June 21, 2018. ^ "USL Unveils New Structure: One Central Brand, Three Leagues, Evolving for the Future" (Press release). United Soccer Leagues. Retrieved September 25, 2018. ^ "USL's second-division status maintained by U.S. Soccer Federation". USA Today. Associated Press. January 16, 2018. Retrieved March 4, 2018. ^ "The MLS-USL partnership remains a work in progress". SI.com. Retrieved June 23, 2018. ^ Kaufman, Michelle (November 24, 2017). "Miami FC's future is in jeopardy. A court ruling could save the team". Miami Herald. Retrieved November 26, 2017. ^ Chopra, Nipun (September 20, 2017). "The NASL's decision to litigate was not unanimous". soctakes.com. Soc Takes. Retrieved September 27, 2017. ^ "FC Edmonton leaving league, discontinuing professional operations". CBC News. Retrieved November 24, 2017. ^ Neil Morris [@ByNeilMorris] (September 20, 2017). "@NorthCarolinaFC not issuing statement. But sources close to club say NCFC does not support NASL lawsuit v USSF" (Tweet) – via Twitter. ^ "North American Soccer League Announces Move To International Calendar". NASL.com. NASL. January 8, 2017. Retrieved January 8, 2018. ^ "NASL cancels complete 2018 season after court ruling". ESPN.com. February 27, 2018. Retrieved March 4, 2018. ^ Carlisle, Jeff (February 23, 2018). "Court denies NASL's appeal for injunction". ESPN.com. Retrieved February 23, 2018. ^ "Orlando City B Joins USL Division III for Inaugural Season" (Press release). Orlando City SC. September 6, 2018. Retrieved September 7, 2018. ^ "Rochester Approved for USL Division III" (Press release). Rochester Rhinos. August 22, 2018. Retrieved August 22, 2018. ^ "Major League Soccer to sell ad space on jerseys". ^ "WUSA Granted U.S. Soccer Membership as Division I Women's Professional Soccer League". www.ussoccer.com. Retrieved January 5, 2016. ^ "Cash-strapped WUSA folds after 3 seasons". Arizona Daily Sun. Retrieved January 5, 2016. ^ "WSII". wsii.typepad.com. Retrieved January 5, 2016. ^ "SOCCER.COM || WUSA – Women's United Soccer Association". www.soccer.com. Archived from the original on August 21, 2004. Retrieved January 5, 2016. ^ "U.S. Women's Pro League Prepares to Blast Back Onto Soccer Scene | Fox News". Fox News. June 28, 2006. Retrieved January 5, 2016. ^ "Relaunch of WUSA set for spring 2008". ESPNFC.com. Retrieved January 5, 2016. ^ "Women's pro soccer team put on hold – St. Louis Business Journal". St. Louis Business Journal. Retrieved January 5, 2016. ^ "U.S. Soccer President Sunil Gulati Announces New Women's League to Begin Play in Spring of 2013" (Press release). United States Soccer Federation. November 21, 2012. Archived from the original on January 1, 2013. Retrieved December 4, 2012. ^ "U.S. Soccer Unveils Name of New Women's Soccer League" (Press release). United States Soccer Federation. December 15, 2012. Archived from the original on April 3, 2013. Retrieved December 21, 2012. ^ a b c d Carlisle, Jeff (November 21, 2012). "Hopes high for new women's soccer league". ESPN FC. Retrieved December 4, 2012. ^ "New soccer league to feature 8 teams". espnW. Associated Press. November 21, 2012. Retrieved December 4, 2012. ^ "FC Kansas City to Play at Swope Soccer Village in 2015" (Press release). FC Kansas City. January 13, 2015. Retrieved March 19, 2015. ^ "NWSL Awards Club to Orlando City" (Press release). National Women's Soccer League. October 20, 2015. Retrieved October 22, 2015. ^ "North Carolina Football Club enters into agreement to acquire rights to NWSL's 2016 champions Western New York Flash" (Press release). North Carolina FC. January 9, 2017. Archived from the original on January 10, 2017. Retrieved January 9, 2017. ^ Kassouf, Jeff (January 25, 2018). "The Boston Breakers' demise is another step toward an unrecognizable NWSL, but in which direction is the league headed?". FourFourTwo. Retrieved January 29, 2018. ^ "World champions USA back on top" (Press release). FIFA. July 10, 2015. Retrieved July 10, 2015. "American Exceptionalism: Soccer and American Football" by Ivan Waddington and Martin Roderick, September 2, 1996, retrieved December 6, 2005.